One section of this site allows readers to ask me home management questions. Rita has done just that below, asking a question about distilled white vinegar. I want to know please, about distilled vinegar? Can I buy it already distilled or can I distill it myself? If yes, how please? Thanks for such an interesting website. I find it very helpful. Thanks Rita for visiting my site. Distilled white vinegar can be a very useful item around anyone's home. For instance, vinegar can be used to clean lots of items in your home, generally in combination with other ingredients to make homemade cleaners. The reason, by the way, that I recommend distilled white vinegar for cleaning is that it does not have a color, and therefore will not stain things while you are in the process of cleaning them. Distilled white vinegar also has the advantage of being quite inexpensive, and is readily available. There is no reason to have to distill your own. You can find distilled white vinegar in supermarkets and groceries, and also big box stores such as Walmart and Target. You can also buy it online from a grocery retailer, such as Amazon.com. I do suggest if you plan to use distilled white vinegar for a lot of uses, such as if you decide to begin cleaning your home with more homemade cleaning products, that you buy your vinegar in bulk because this saves you money. 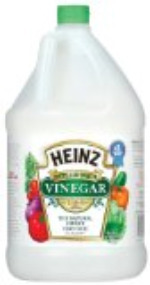 For vinegar, the most convenient bulk form is to buy it by the gallon. I hope you have found this information helpful. Do you have any home management questions you would like to find an answer to? If so, submit your home management questions here. You can also read other questions and answers already submitted here.